We each have psychological tendcies that prevent us from seeing that our choices and behaviors might be unethical. These tendencies are known as BlindSpots. By gaining an understanding of your BlindSpots and by developing skills to promote a more postive culture, you can prevent ethical missteps and ultimately strenghten your organization. Leadership Tomorrow has recently created a new training for executives, the LT Executive Series. 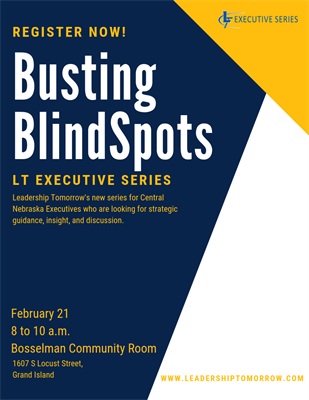 This will be a four-part series addressing a different topic each quarter geared toward Central Nebraska executives who are looking for strategic guidance, insight, and discussion on business leadership topics. 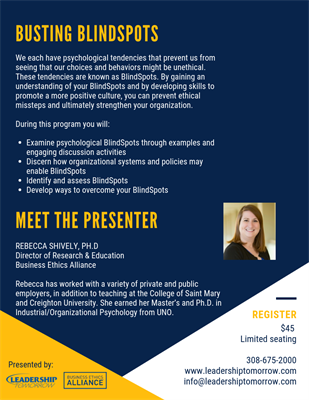 The frist session, Busting BlindSpots, is presented in partnership with the Business Ethics Alliance of Omaha.